These Business Checks are the ones you fill out by hand. ASAP Business Checks are compatible with the same ones you order from your bank or check printer (such as Deluxe and Harland Clarke). We use a premium quality check paper that features extensive security features. ASAP Checks will beat any price and most orders are ready to ship in just 1 day. Our Business Checks are guaranteed to be fully compatible or you receive a 100% refund. If you have ordered from us before and wish to Reorder, sign in (top right), click on My Account and choose the previous order you wish to reorder from. 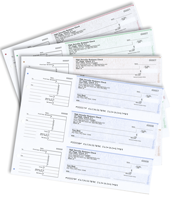 Three streamlined checks (7" wide x 2-7/8") per 8-1/2"x11" sheet with a stub to the left of each check. 3-hole punched, they fit in the optional binder. There is a huge difference in Business Check prices. Business Checks always cost more than Personal Checks. Banks and traditional check printers (eg. Deluxe, Harland Clarke) are usually the most expensive. New generation printers (eg. ASAP Checks) and aggressive retailers (eg. Walmart) can save you 50% to 80%. Order cheap checks online at ASAP Checks! Are business checks different than personal checks? Yes. Business checks come in a variety of sizes (as large as 8.5" wide by 3" high, sometimes with 1 or 2 stubs/voucher) and are suitable for encoding business account numbers and check numbers longer than 3 digits. In some cases, it may still be possible to use personal checks for business bank accounts. Great, your staff has always been VERY helpful! I have been a repeat customer for more than fifteen years or so. When my children started banking I also referred them to your company. Never have had a problem. Always reasonable costs. Will be a repeat customer for many years to come. And so will my children.